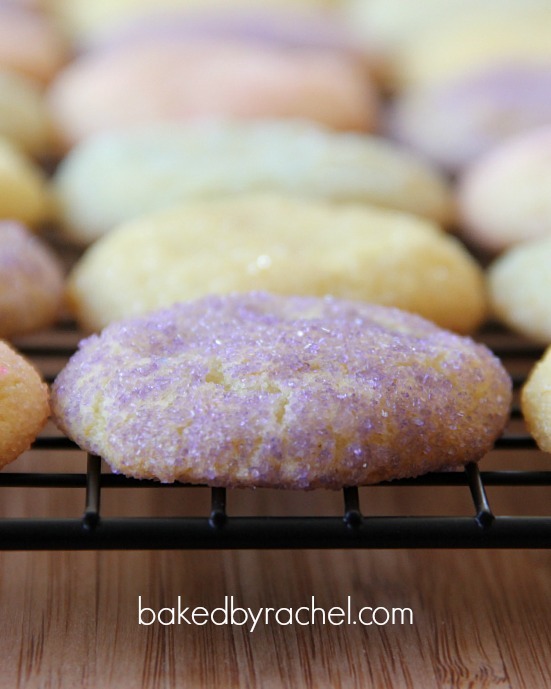 Easy and colorful lemon sugar cookies, perfect for Spring and Easter celebrations. Over the last handful of weeks I’ve been debating what food items really shout spring. Sure there’s asparagus and other veggies. There’s even strawberries… or so people in other areas of the country say. Strawberries aren’t ready until June up here. Finally I decided lemons are where it’s at. Whether they’re shipped in or not, they’re clearly a colorful tangy way to ring in spring. Of course that then left me back in debate mode with what to make! 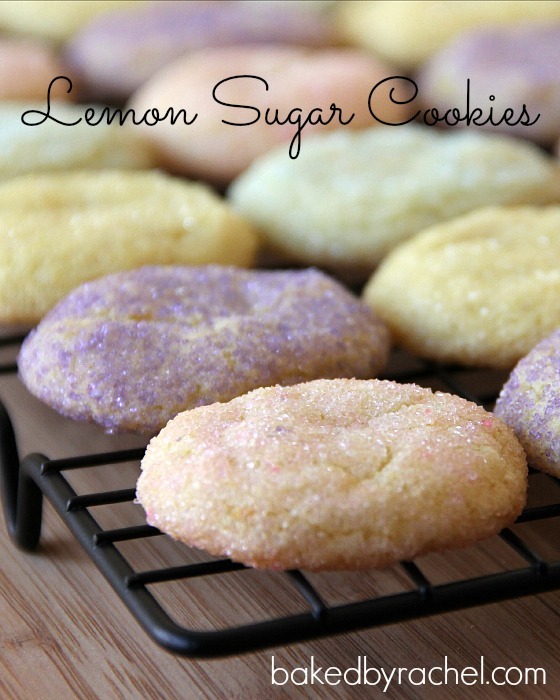 Back and fourth I flip flopped around over various possibilities finally settling on these lemon sugar cookies. They’re quick, simple and fun for the kids to get involved with. Best of all, they’re tasty. So much so that they disapear fast. Make them and you’ll see! I love that you can play around with the colors and even make them match Easter eggs, should you choose to. 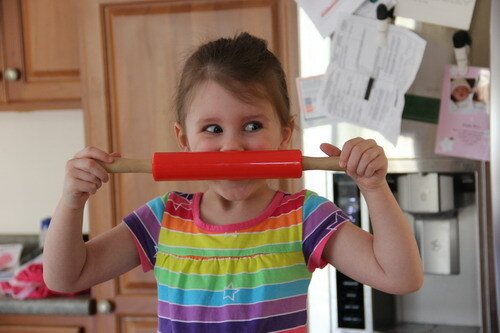 Someone got a little goofy while waiting for the dough to chill. Waiting is hard when you’re 3… or 30. Patience isn’t in our nature. Preheat oven to 400 degrees. Prepare baking sheets with silpat or parchment. In a medium bowl combine flour, cream of tartar, baking soda and salt. Set aside. In a large bowl or stand mixer cream butter, shortening and sugar until light and creamy. Scrape bowl as needed and prior to each new addition. Add eggs and zest. Mix until just barely combined. Slowly begin adding flour mixture. Mix on med/low until fully combined. Chill dough for at least 15 minutes. Meanwhile prepare desired sanding sugar into small bowls. 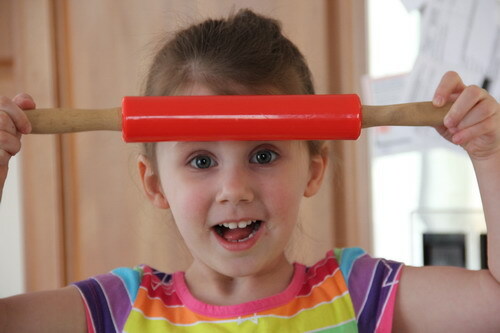 Grabbing a teaspoon amount of dough, roll into neat balls. Gently roll dough ball into desired sanding sugar color. transfer coated ball to a prepared baking sheet. Repeat with remaining dough, spacing balls at least 2 inches apart (minimum of 12 will fit a regular baking sheet). 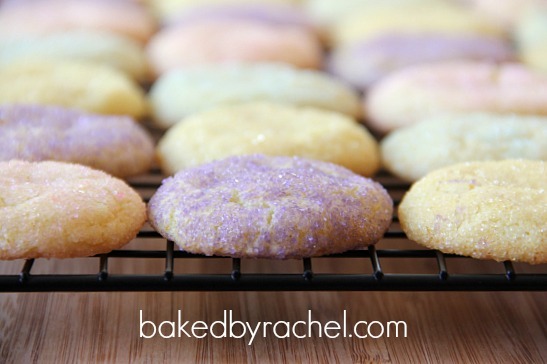 Bake for 7-8 minutes or until edges are just slightly turning a golden color. Let cool on pan for 1-2 minutes before removing and transfering to a wire rack to cool completely. Store in an airtight container for up to several days. Any remaining dough can be frozen for up to several months if sealed well. Label properly with name and any important instructions such as bake temp and time. 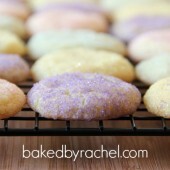 Note: I halved this recipe as the original states that it makes 6 dozen cookies. Either make the full batch for a crowd, freeze part or halve it as I did. Full recipe is below.